Do you believe desserts are evil? I don’t. While our household doesn’t indulge very often, I believe it’s perfectly fine to make dessert for a special occasion. As long as we’re eating a healthy diet filled with lots of vegetables and other real foods, what’s wrong with an occasional indulgence? Unfortunately one of the many things that’s happened to our food culture over the past 50 or so years is that desserts and treats have morphed from something special into a habit we indulge in daily—or even worse, several times a day. Further exacerbating the issue is the quality of ingredients in these treats—they simply don’t resemble anything close to real food. So while you’ll never hear me say desserts like cake are healthy, I honestly believe that if they’re made from ingredients we recognize, our bodies can handle the occasional indulgence with greater ease. So when there’s a celebration at our house, I usually take the time to make a special dessert … like this delicious Strawberry Cake. Perfect for springtime holidays like Easter or Mother’s Day or maybe even a birthday party, this cake is absolutely beautiful. Made with 100% whole wheat pastry flour, real strawberries, and the juice and zest from real lemons, this cake is alive with flavor. And if you’re a little short on time, I’ve provided some time-saving tips in the recipe that should make this cake totally doable in less than an hour! So ditch those boxes of cake mix and kick those tubs of frosting to the curb. And instead, start baking up a REAL, delicious dessert for your family’s next special occasion. Cream room temperature butter in stand mixer. Add sugar 1 cup at a time, beating briefly between each addition. In a separate bowl whisk together whole wheat pastry flour, baking powder, and salt. Add 1 cup of flour mixture to butter. Blend briefly. Add ½ cup buttermilk. Blend briefly. Alternate additions of flour, buttermilk, flour, blending briefly between each. Split batter between four prepared 8-inch cake pans. Bake for 16-20 minutes or until a wooden toothpick inserted into the center of the cake comes out clean. Cool cakes in pans on wire rack for 10 minutes. Then remove from pans and cool completely on racks. Puree strawberries in a blender or food processor until smooth. If at all pulpy, strain through a wire-mesh strainer or cheesecloth to remove pulp. In a 3-quart saucepan add pureed strawberries and maple syrup (or sugar). Bring mixture to a boil over medium heat. Cook for about 2-3 minutes, stirring constantly, and reduce to simmer. Whisk together cornstarch and lemon juice. Add to strawberries and whisk constantly until smooth and thick (about 2-4 minutes). Remove from heat. Cool jam completely in your refrigerator before using (usually 1-2 hours). To speed this process up spread jam on a rimmed baking sheet and cool in your refrigerator for 30-45 minutes. This jam can be made up to a week ahead of time. Refrigerate covered in an airtight container. Using a handheld mixer beat the cream cheese and ½ cup of powdered sugar until smooth. Add strawberries and beat until blended (you still want visible chunks of strawberries so don't overbeat). In a separate bowl or stand mixer beat cream and lemon juice at medium speed until foamy. Increase the speed to high, stopping to add the remaining ½ cup of powdered sugar in two additions. Beat until stiff peaks form. Fold the whipped cream gently into cream cheese mixture. Use immediately. Place one cake layer on a serving platter. Spread ½ cup of jam on top of the cake leaving a ¼ inch border around the edges. Repeat for the second and third layers. Top with last cake layer. Spread Strawberry Frosting on top and sides of cake. If you want to replace the sugar in the cake, swap 1½ cups honey or maple syrup for the 2 cups sugar and reduce the buttermilk/milk by ¼ cup. Lower the baking temperature to 325 degrees F. Cook time will be a bit longer. When the center of the cake no longer giggles, test with toothpick every couple of minutes until it comes out clean. For a lighter, less dense cake, separate the eggs. Add the egg yolks as directed in the original recipe. Beat the egg whites on medium speed until foamy then increase the speed to high until firm and stiff peaks form. Fold the egg whites into the batter gently after adding the zest and lemon juice. When there are no visible egg whites streaks in the batter, it's properly mixed. Don't overmix! Prepare 8-inch cake pans by greasing with butter and coating the greased pan with whole wheat pastry flour. I also use parchment paper to line the bottom of the pan for an easy, quick release. 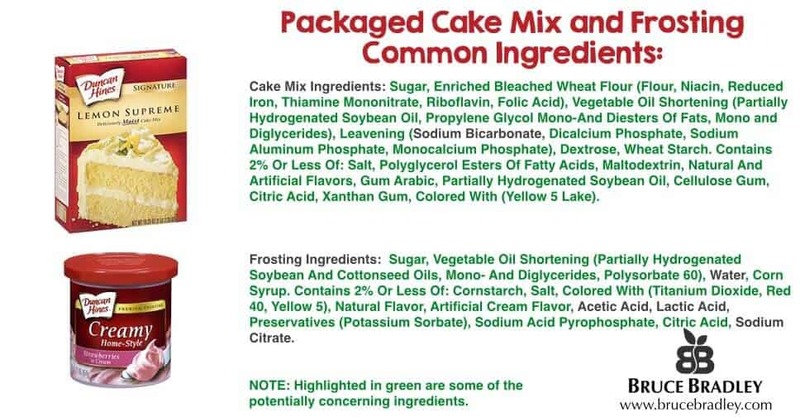 I make my own baking powder since so many making baking powders have aluminum in them (in the form of sodium aluminum phosphate and / or aluminum sulfate). It’s very easy to make: two parts cream of tartar and one part baking soda. If you're looking for a couple quick ways to simplify this recipe, here are some ideas: (1) bake the cake in two layers vs. four—the bake time will increase though (use a toothpick to check doneness) and (2) skip the strawberry jam filling and make 1.5 times the strawberry frosting. Use the frosting instead of the jam between the cake layers. I love my KitchenAid stand mixer. I’ve had it for 20 years now and it continues to keep going strong. It’s perfect for so many kitchen tastes, but it comes in especially handy when baking! I used my Blendtec blender to purée the strawberries for the filling and the result was so smooth, there was no need to strain out any pulp. I love my microplane zester for the lemon zest. It truly makes zesting a lemon quick and easy! Once you’ve tried this zester, you will wonder why you’ve been using other graters for all these years! When I’m making this cake I use four, 8-inch round cake pans—but you can certainly use two and make it a simpler, two-layer cake! If you’ve never baked cakes using parchment paper you should definitely give it a try. Butter and flour your cake pans, then insert a piece of parchment paper you’ve cut out to match the size of your pan. Gone are the days of cakes not coming out easily! Here’s the type of parchment paper I use—it’s unbleached and Green Seal Certified. When you’re baking cakes you really need some racks to get them to cool off quickly. I love these tiered cooling racks since they’re perfect for cakes or cookies … and they can save you some kitchen counter real estate! When you go to all the trouble of making a cake, you really do need something to store it in or help you take it to a party. I bought this BPA-free Sterlite cake keeper at Target, and it works great (it’s also available on Amazon and lots of other retailers).